Looking for advice on natural health and wellbeing? Your local independent health store can offer a wealth of knowledge and expertise. 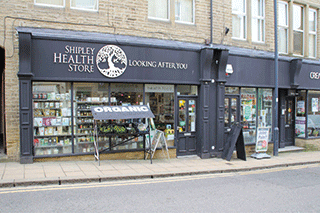 This month we speak to Jonathan Martell of Shipley Health Store. As a part of our local community, we like to hope we help families to make healthier choices at every stage of life. In theory, if we can reach as many of the young generation as possible then we will be helping to shape a healthier future for our local area. Mums, dads, grannies and grandads come in for all sorts of advice on helping their little ones thrive – from probiotics and healthy snacks, to sleep and concentration at school. Of course there’s also body care issues like eczema and allergies and we love helping to advise on natural ways to help. We don’t like to preach. If parents come in looking for advice, or they’ve received confusing health messages elsewhere, then we like to explore the options with them. There’s never one product that fits everyone and so if we discuss options with our customers then we can work out what suits their needs, and the needs of their families. We have lots of questions about probiotics in store and gut health is a massive area for children’s health. Many children pick up bugs and bacteria at school and nursery and so they are more likely to end up on antibiotics. Rebalancing their gut flora after any course of antibiotics is key and many parents are now aware of the importance of the gut as the second brain. We stock all kinds of probiotics including powders and sprays so children don’t even need to know they are taking them. We are increasingly recommending kefir as a morning drink for everyone – adults and children alike. This fermented milk drink is a particularly good way to dose up and make sure you are getting a good range of probiotics. Of course we can also tick the prebiotics box by helping with organic fruit and veg. Once children reach school age we see many parents asking for advice on brain development and helping their young ones to concentrate. Fish oils are our go-to product here. And of course, masking the taste is all important so something chewable and flavoured is often the name of the game for youngsters. Choosing healthy snacks for children is also an increasingly popular topic. Parents are aware that their children are now meant to stick to two 100 calorie snacks per day. But once they get into a supermarket they often find hundreds of products professing to be a healthy option even though that might not actually be the case, if they come to us then they know that what they see on the shelves will be a good option for their children. 1. Using cinnamon in warm milk – it will give children a sweet taste without the sugar hit. 2. Creating colourful food to attract youngsters using turmeric. We have parents in the shop who have decided to raise their children on a vegan diet and often want to supplement their intake of some vitamins. Dietary yeasts and so-called superpowders are great here and we can guide parents through many options. Engevita is increasingly popular for making sure parents can keep vitamin B12 in their children’s diets. For us, one of the most encouraging trends we see in health for the younger generation is that millenials come in to the store more and more. They are a whole new generation who, as a whole, take a keen role in shaping their health. We love to think that, in time, they will then be in with their children and with each generation we will move towards a healthier society. This thriving independent in Shipley was opened by current owner Jonathan Martell in 2012. It is dedicated to serving its local community through the store and its regularly update blog. Head in store for tastings, supportive advice and extremely knowledgeable customer service.